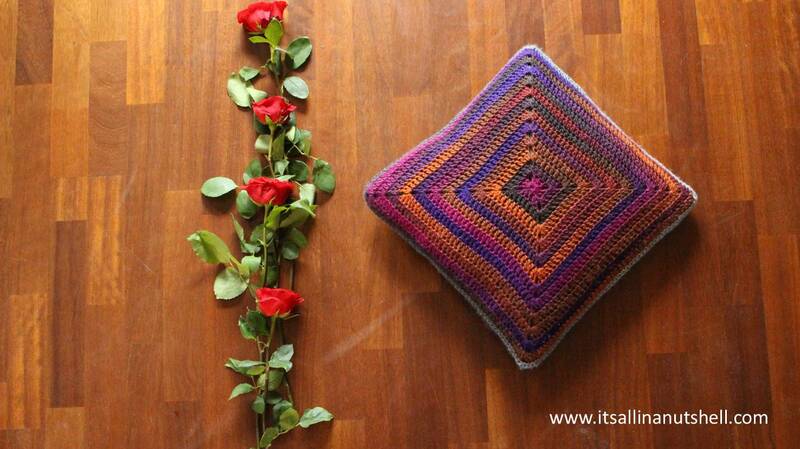 I would love to show you a neat way to use variegated yarn to make a quick gift or decorate you house with a lovely continuous crochet square cushion. After all, you can never have too many cushions. My cushion is based on the pattern Joy’s Journey by Dedri Uys and uses Scheepjes Noorse Sokkenwol Color. You will need 2 balls of Scheepjes Noorse Sokkenwol Color. I used two colors, one for each side of the cushion, giving a fun two-sided look. I used colors 951 and 967 plus a 4.5mm hook. In addition to the yarn, you will also need a 45cm x 45cm cushion inner. Scheepjes Noorse Sokkenwol Color is available from Wool Warehouse or your Scheepjes stockist. Thank you for using the links on my blog, supporting my work and helping me to keep my work available for free. Gauge is not essential for this project and it’s not needed to make a gauge swatch. If your gauge is similar to mine you will be able to make a 45cm x 45cm cushion. Print this post using the “Print & PDF” button at the bottom of the post. If you would like to make a cushion or blanket of your own using Dedri’s pattern, I have a short video tutorial to show you how to make Joy’s Journey. Make 2 identical continuous squares using the pattern Joy’s Journey till each square is approximately 45cm x 45cm. Work away the yarn tails of both squares. Place the two squares with their backs to each-other. Using one of the yarn colors used to make the squares, join 3 edges with single crochet stitches. In the corners work 3 single crochet stitches. Put the cushion inner inside the joined squares. Join the final edges of the squares with single crochet stitches. Work away your last yarn tail. If you enjoyed making this pattern you could consider doing a full size blanket with it. It is fabulously relaxing and a wonderful destresser. 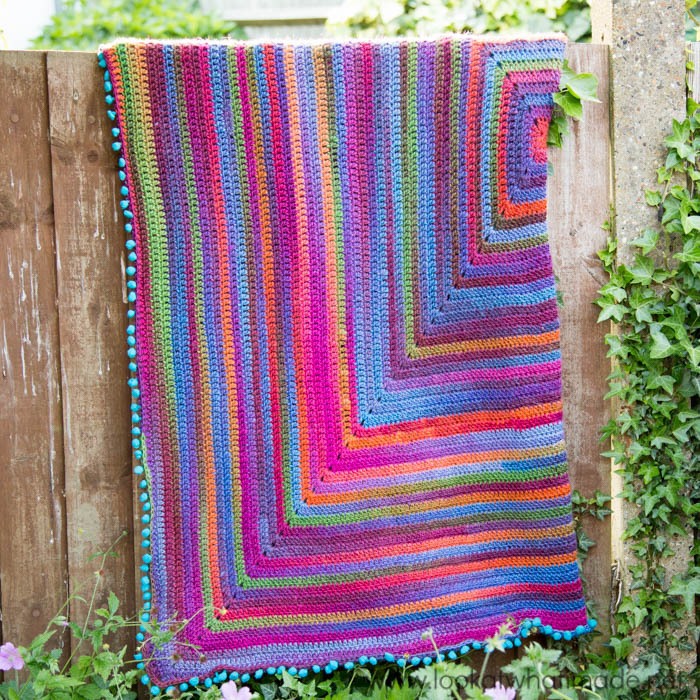 There are yarn packs available for Joy’s Journey to make a Baby Blanket or a Large Blanket. The yarn packs include yarn, a printed pattern and a pom-pom ribbon to make the border. I am really happy with my cushion and my boys love it too. My eldest said it was the softest cushion he has ever laid his head on. Gotta love that yarn! The two colors I chose are completely different, so my cushion has a metamorphoses every time I turn it around. I would love to see your cushions, which colors you chose and how they came out. Feel free to share them on my Facebook page or tag me in one of your post on Instagram. You can also use #itsallinanutshell to help me find it. © COPYRIGHT IT’S ALL IN A NUTSHELL. ALL RIGHTS RESERVED. THIS PATTERN IS AVAILABLE FOR UNLIMITED PERSONAL USE. YOU MAY PRINT A COPY OF THE PATTERN OR KEEP A DIGITAL COPY FOR PERSONAL USE ONLY. DO NOT REPRODUCE OR SELL MY PATTERNS (EITHER DIGITALLY OR IN PRINT). DO NOT POST MY PATTERNS ONLINE, EITHER AS A COMPLETE DOCUMENT OR IN PART. PLEASE REFER BACK TO THIS PATTERN BY LINKING TO IT FROM YOUR BLOG OR WEBSITE. YOU MAY SELL ITEMS THAT YOU MAKE WITH MY PATTERN AS LONG AS YOU CREDIT ME AS THE DESIGNER. TO SHOP OWNERS AND YARN SELLERS : IT IS NOT ALLOWED TO MAKE KITS WITHOUT MY PERMISSION. PLEASE DO NOT PRINT COPIES TO DISTRIBUTE WITH YARN SALES AS THIS IS AN INFRINGEMENT OF COPYRIGHT. THE COPYRIGHT OF THIS FREE CROCHET PATTERN IS PROTECTED BY SCHEEPJES.COM. I do love your cushion! Thank you for the pattern, when I finish my WIP’s (too much to make, not enough time! ), I want to make this cushion. I love the idea of the two different coloursways. Clever. Thank you for making this video, Esther. Your cushions are lovely!